Any broadcaster who can go from humpback whale discussion to "I prefer to breed year-round" is appreciated here. Bill Walton: "Did your dad play for Jerry Tarkanian?" Jason Benetti: "My dad was an air traffic controller." Bill Walton: "How cool would it have been, though, if your dad had played for Jerry Tarkanian?" Bill Walton just mentioned the World's Largest Truck Stop in Walcott. Life is good. 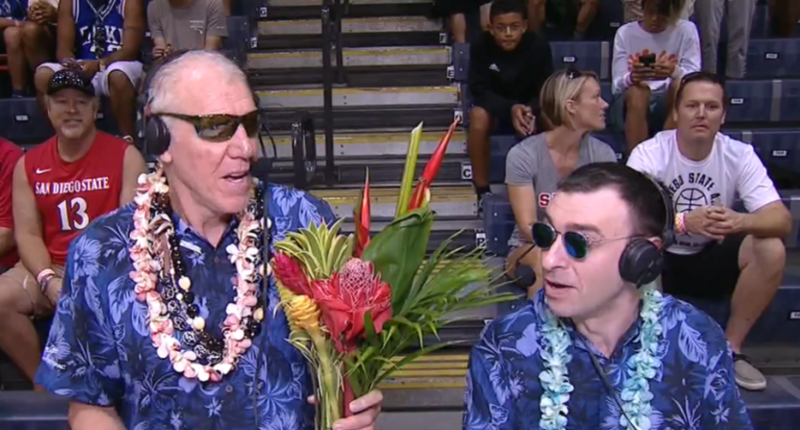 I need more Bill Walton in my life. Goes from saying the refs should quit calling tic tac fouls to explaining volcanic island formation and the biodiversity contained on them without missing a beat. There are always going to be plenty of people criticizing Walton and hoping for more standard analysis, but he’s very appreciated from this corner. We’ll take non-sequiturs about humpback whales over typical color commentary any day.